Join us for a weekend of local fiber, local dyes, local labor, and local wine in Rochester, MN! On Saturday June 8th and Sunday June 9th the Three Rivers Fibershed will have a Marketplace at the Salem Glen Winery. The Marketplace will feature local producers/mills from within the Three Rivers Fibershed strategic geography. It will be a great opportunity to meet your local producers and purchase yarn, roving, pelts, fleeces and finished goods, all raised and made within 175 miles of Minneapolis, Minnesota. For individuals interested in participating, a link to the vendor application for this juried show can be found here. Hope to see you there and please spread the news! Hello! My name is Libby London and I founded Northern Dyer in 2014 (previously Born and Dyed in MN) where I primarily focus on researching and growing natural dye plants for pigment, fiber, and art. 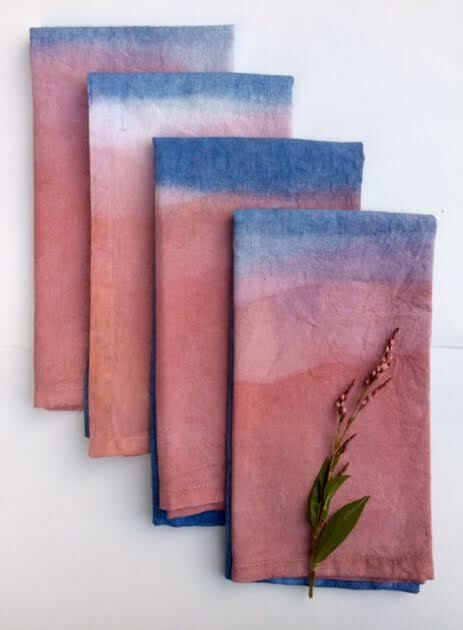 I first learned about natural dye when I was 16 and had the opportunity to apprentice with an artist specializing in handmade paper. The studio was called Cave Paper and is still around today. It is located in the North Loop of Minneapolis in a cave-like underground studio. During this unique experience I learned about using handmade paper for book arts, textile design, installation art, and interior design. I spent my time turning raw flax fibers straight from a straw-colored bale of flax into gorgeous sheets of handmade paper, and afterwards the artists would dye the paper with natural Indigo and Black Walnut. As a novice, I was prohibited to actually dye these gorgeous rich purple and deep brown sheets of paper, but I remember watching the artists boil up Black Walnut hulls and dip the bare neutral colored sheets into the Indigo vats, and sometimes I’d be allowed to hang the sheets up to dry in a large breezy room filled with hundreds of drippy purple and brown sheets of paper hanging to dry. I went on to study papermaking, fine art, art history, and sustainability in college at the University of Minnesota - in Minneapolis. During college I spent time on an organic farm, and afterwards focused my attention on sustainable farming and went on to Co-Found an organic "young farmer incubator farm" called Sandbox Center for Regenerative Entrepreneurship (Sandbox) in Ham Lake, MN and served as Co-Director of the Permaculture Research Institute - Cold Climate, a Minnesota non-profit that provides organic farming workshops, learning programs, apprenticeships, and facilitates cold climate farming research. These experiences opened my eyes to the realities of our current ecological challenges with climate change, water access, and environmental pollutants, as well as the possibilities for addressing these challenges through economic development and community-based solutions. At Sandbox, we supported emerging farmers in starting their first businesses, and it was there that I started my own practice of growing and cultivating plants for fiber and natural dyes. I wanted to try my hand at growing my own flax for papermaking. While talking to my grandpa who spent his life in Fargo, he told me that decades ago Minnesota and North Dakota used to be the home to many thousands of acres of flax, but it is not common anymore. At Sandbox, I started with a small portion of a field, and grew two flax varieties, two cold climate indigo varieties, and native and hardy annuals used for dye. Currently, I’m focused on researching organic production of cold climate natural dye varieties, designing dye garden plant guilds that have multiple purposes for animals and insects as well as humans, planning a larger-scale indigo farm-site, creating custom dye orders for clients, and creating natural dye recipes that use 100% compostable materials so that no chemicals are part of my processes. I believe that designing and implementing a healthy fibershed in Minnesota means incorporating perennial systems, plants for food & medicine, animals, drought tolerant native plants, and regenerative economic and social systems as we address a changing ecosystem and climate here in Minnesota. Libby London is an artist and gardener based in Minneapolis. She specializes in researching cold climate natural dyes, teaching, and growing dye plants. She runs her natural dye business, Northern Dyer, and serves as co-chair of the Permaculture Research Institute - Cold Climate. You can follow her on Instagram @northerdyer. Calling all fiber producers within the Three Rivers Fibershed! In August 2017, the Three Rivers Fibershed was awarded a micro-grant from the Northern California Fibershed. The focus of the grant centers on local producers who are isolated from resources and sustainable fiber production communities. By beginning to facilitate a network of producers who can find support within the Three Rivers Fibershed region, we hope to see the fiber aspect of their farm not only sustain them, but flourish. Producers will have support to work together to build fiber community that is making a profit off of their fiber products with ample access to avenues for markets. There will be a system of active, engaged local fiber producers working together to support the collective fiber community within our Fibershed, with some fiber producers willing to step into leadership roles to facilitate ongoing producer education around any of the challenges producers within our Fibershed are facing. This local producer support system will be built on a foundation where it is self-sustaining and self-regulating: what can local producers do for local producers? Empowering local producers to rely on each other for insight, guidance, and community building. So what will the project look like and when is it happening? Three Rivers Fibershed will host and moderate two, in-person local producer workshops, offered at no cost to producers, with presentations by members of our fiber community. The first workshop on October 21, 2017, from 10am-5pm, will place a focus on our Fibershed’s collective strengths and challenges, marketing, branding, product presentation, telling the story of your farm and its fiber, and connecting with consumers and appropriate markets for optimal financial value. This workshop will be held at the farm of Lydia’s Flock in Harris, MN, lunch and workshop materials will be provided. The second workshop, slated for January 2018, will focus on basic regenerative grazing practices to improve pasture health and sequester carbon, fleece health and shearing for high value fleeces, raising sheep for high value fiber, funding opportunities to grow your fiber operation, tracking fiber sales and expenses, and utilizing the MN State Colleges Farm Business Management program. These workshops will be paired with one-on-one farm visits by our Producer Outreach Coordinator, who will, using a basis analysis for each producer’s fiber operations, assist producers in identifying internal and external successes and challenges of their individual operation. Information collected on farm visits will be used to determine the top five needs of producers in our area. By determining the top needs of our producers and providing free resources through our workshops, we believe a network of producers will be created. Within this network our producers can find support from their fellow producers and access to consumers within our Fibershed to sustain the fiber aspect of their farm. Why focus on local producers? Our project is designed to address the needs of aspiring and established local fiber producers within the Three Rivers Fibershed. Many of our producers are looking for a support system in order to sell value-added products while connecting with consumers who will pay a premium for locally grown and produced fiber as well as share information around small-scale sustainable shepherding–including but not limited to optimal grazing practices, finding a shearer, parasite management, insight as to which fiber animals flourish in our climate, and locating a mentor. The need for this project is great. Within our Fibershed, the availability of in-person venues for sales and education around local fiber is significantly limited or unavailable, highly inconsistent or inappropriate for our producers. The second challenge comes through the lack of proper branding and packaging of local fiber to pique consumer interest, resulting in missed opportunities for producers to share the story of each local producer’s farm and fiber. Producers have shared that local fiber is not seen as value-added and believe many consumers are unwilling to pay a premium for local fiber. There is a feeling that local producers are up against the commercial sheep industry in our radius who see wool as a by-product, resulting in some producers throwing away or burning raw fiber directly after shearing. Additionally, rural fiber producers often feel isolated and out on their own, without a support network in which to connect with fellow fiber producers in their area and establish markets that fit with or is fair to their price point. What are the desired outcomes of this project? There are four outcomes of this project. First, we will encourage and empower producers within our Fibershed to work together as a community in collaboration, supporting each other in the marketing and growing of the market for local fiber in ways and terms that best fit the needs of each individual farm as well as the overall community. Second, we will help local producers establish foundational avenues to venues that are appropriate for fiber being sold at the optimal price point. Third, we will assist producers in determining what farming practices are adding value and how to maximize it; by offering resources to connect to a local producer support system, producers can realistically adjust goals. And finally, our project will catalyze our long-term outcome of building a local fiber community that is making a profit off of their fiber products while simultaneously building nutrient dense soils on their farms through sustainable and regenerative grazing practices. If you are interested in participating in these workshops as well as the one-on-one farm visit with our Producer Outreach Coordinator, sign-up for the first workshop can be found here. After registering for the workshop, we ask that you fill out the basic demographic survey, found here. If you have any other questions, feel free to contact us at threeriversfibershed@gmail.com.